Public Employees Local 71 is seeking a Northern Region Administrative Assistant / Dispatcher located in Fairbanks, AK. The ideal candidate for this position will demonstrate the highest commitment to teamwork, integrity, and composure exercising exceptional verbal and listening skills in addition to organizational abilities and familiarization with necessary office programs. Are you a highly committed, organized, and dependable team member looking to make a positive impact helping others in a supportive friendly environment with excellent benefits? Public Employees Local 71 is currently recruiting an Administrative Assistant / Dispatcher for our Fairbanks office. This position will support the Northern Region Business Representative, maintain the Fairbanks Office, coordinate with Headquarters staff, and most importantly support our Members. 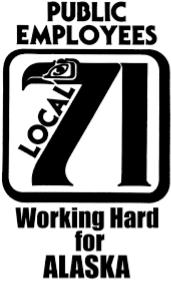 Local 71 is a state-wide Local (Union) under the Laborers International Union of North America (LiUNA) umbrella representing Labor, Trades, & Crafts in public sector positions. The Fairbanks office represents Members in Fairbanks, Kotzebue, Montana Creek, Deadhorse, Sag River, Chandalar, Coldfoot, 7-Mile, Jim River, Barrow, Livengood, Manley, Nenana, Healy, Cantwell, Trimms, Paxson, Nelchina, Ernestine, Slana, Chitina, Northway, Tok, Thompson Pass, Valdez, South Fork, Galena, St. Mary’s, Unalakleet, Cordova, Tazlina, Glennallen, Delta, and Nome. Local 71 prides itself on supporting its Members and its dedication to teamwork. It is our intent to maintain the high quality of services demonstrated in longevity by our incumbent, who is retiring with recognition for her exemplary representation of our Local 71 values. A successful candidate for this position will demonstrate the highest levels of customer service to our Members and our team through dependability, conscientiousness, accountability, compassion, and positivity. This position is required to assist Members with obtaining and maintaining employment, support the Business Representative with duties related to support of our Members, and project the values of teamwork and supportive representation. Recruitment for this position is open until May 14th, 2018.